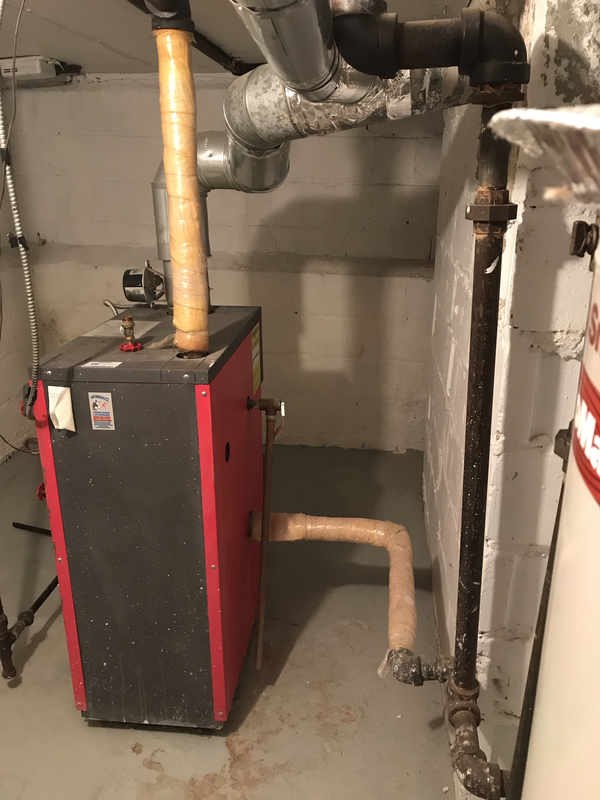 We bought our house 2 months ago, and now own a steam heating system, which is not something I've ever operated before. I've read "We Got Steam Heat" and spent some time reading on here to try to learn some things. The main problem is: The system seems to require water every couple days at most. I fill up the boiler to the line drawn on the sight glass and by the next morning, it's pretty low. By the next night, if the day was cold, I will sometimes come home to a message on the thermostat that it's been asking for heat, but the temp keeps falling. I add more water and then the boiler kicks back on. Obviously, the LWCO (float type) is engaging. Radiators with seemingly random sized vents on them, relative to radiator size and location. They definitely heat up in their order along the mains. The radiator in our bathroom usually doesn't heat up, but a couple nights ago, I was up in the wee hours and heard it burbling and hissing. I closed the supply valve, and the water leakage may have reduced, but I'm not sure. Would this be enough to be losing gallons of water per day? The near boiler piping has issues. There's no Hartford Loop. What should I look for? 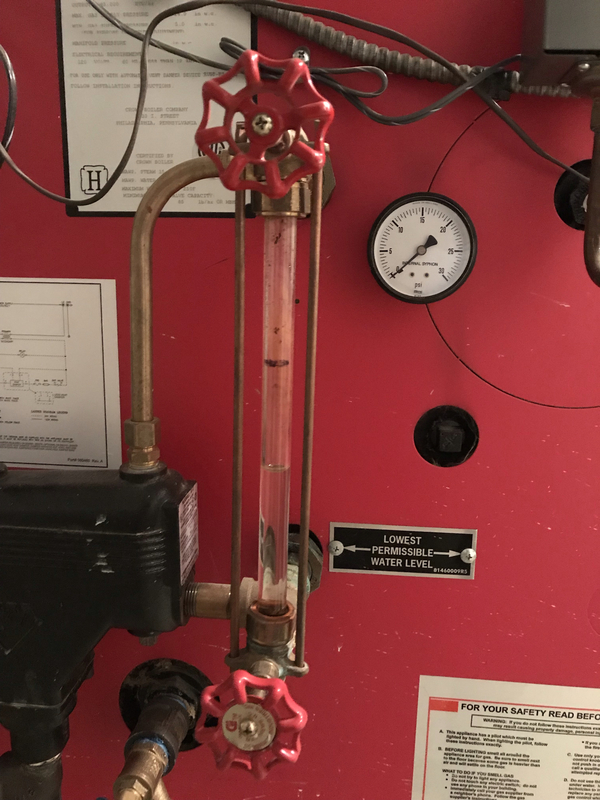 How much should the water level fall when the boiler is on? I've checked and no white smoke from the chimney. Thanks for any help. I'm in North Jersey. It may have been that one vent -- although losing that much water every day it seems there may be other leaks as well. Steam leaks in piping can be very hard to see, as the steam just evaporates into the air. You should also check all the piping below the water line, but you probably would have noticed leaking there this fall when you went to start up, as the boiler would have been empty or nearly so. That said. The near boiler piping is absolutely horrible. So far as I can make out, not only is there no Hartford loop, there is no equalizer and no header. 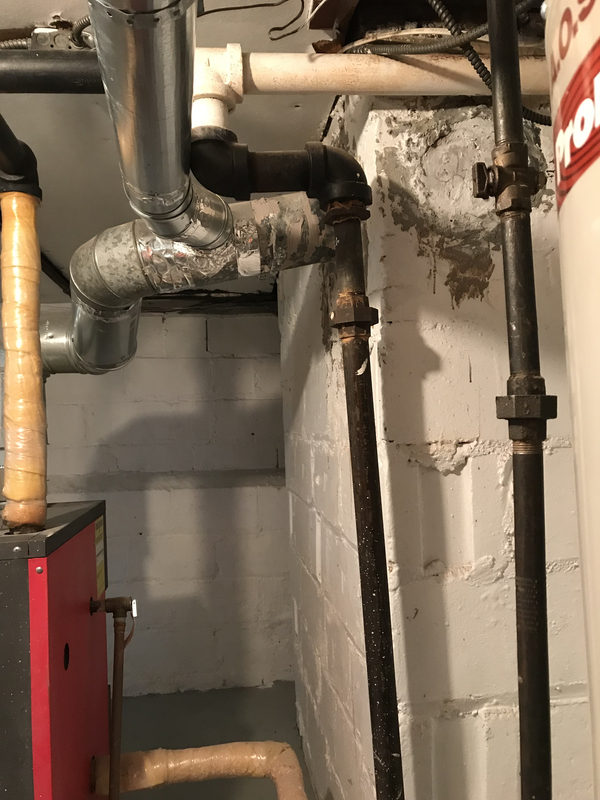 If the boiler isn't leaking -- and doesn't start doing so soon, due to the constant adding of fresh water -- it might pay to see if it could be repiped properly. There is an equalizer. In the last photo, there are two vertical pipes in the center. The one on the right is the return. The one on the left connects to the white T junction, there is a short horizontal section of pipe hidden behind the connection from the water heather to the chimney. If I understand correctly, this is the equalizer. There is very little piping below the water line, you can see all of it in the last photo, I'd think a leak would be noticeable there. The water level was very low when I went to start it up for the winter. That's not an equalizer. That's a drip off of the main. 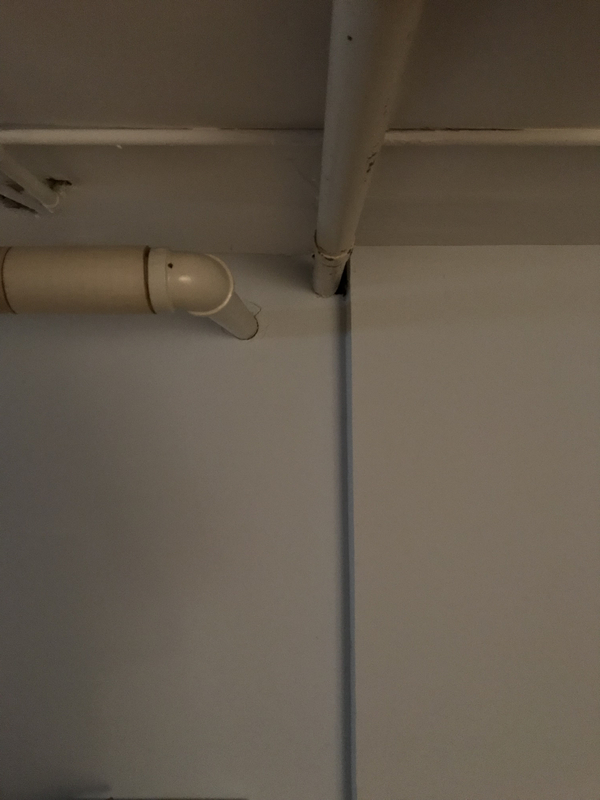 We need to see more of the piping, behind the flue pipe and where it goes as well as the return piping. As Jamie said, the near boiler piping is a mess. Do you hear any other radiator vents gurgling and hissing? Do all the radiators have a slight pitch back to the supply pipe? Has the pigtail (looped pipe that the Pressuretrol is mounted on) ever been cleaned out. It may well be plugged, letting the pressure build high and blowing vents open, letting steam blow out, which can use a lot of water. That boiler piping really needs to be done right. Thank you to everyone for the responses. No, no other radiator vents hiss noticeably. There are two radiators in the attic that never get warm. One has no vent at all, just a hole. The supply valve there is closed. The other one has an open supply valve, but also never gets warm. I see now that it's not an equalizer. I haven't cleaned anything out, except for a weekly LWCO blowdown. I couldn't say what the previous owner did, we've only owned the house a couple months. We do know them, so I could ask. 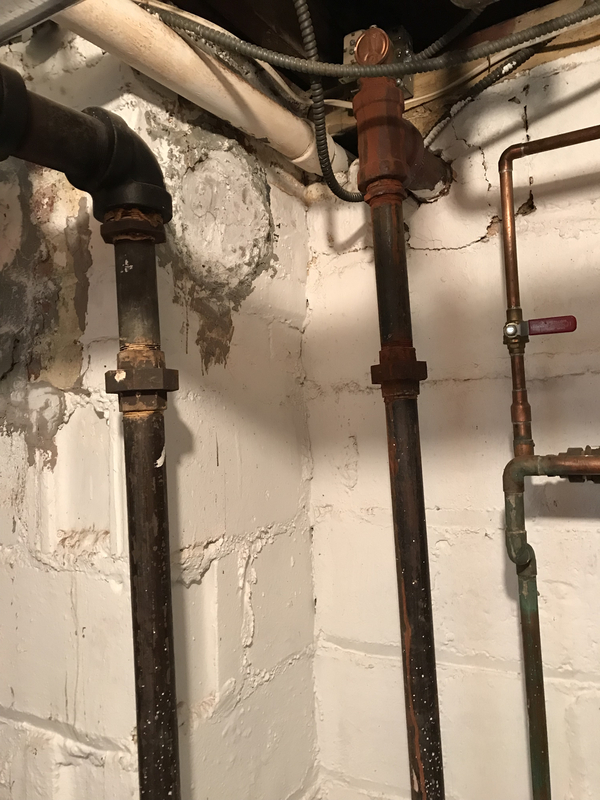 I have someone coming out to do the yearly service, and to address the leak, I will ask about having the piping redone correctly, after I try to figure out if they know what they are talking about. With the boiler shut down, fill it a couple of inches above the top of the sight glass. Look around the boiler for any evidence of leaking, wait two or three hours and check again. Steam leaks are usually above the water line, this will show if your boiler is leaking. 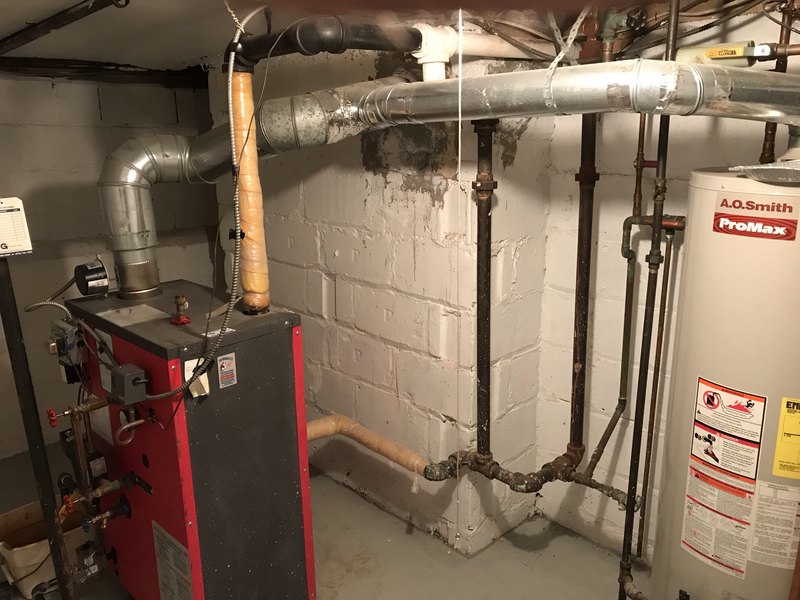 Be sure to drain your boiler down to the normal level before using it. Another way to check is to fire it up during daylight hours, and look outside, at your chimney, if only wisps of smoke are coming out, you are ok. If it looks like a pressure cooker, or a steam engine, then you're going to have to replace the boiler. Thanks Bob. I will check that out. I have looked at the chimney and haven’t seen any noticeable white steam leaving. I’ll check again. Here’s what it looks like behind the flue and on the other side of the wall where the main leaves and the dry return comes back. > With the boiler shut down, fill it a couple of inches above the top of the sight glass. Look around the boiler for any evidence of leaking, wait two or three hours and check again. Steam leaks are usually above the water line, this will show if your boiler is leaking. 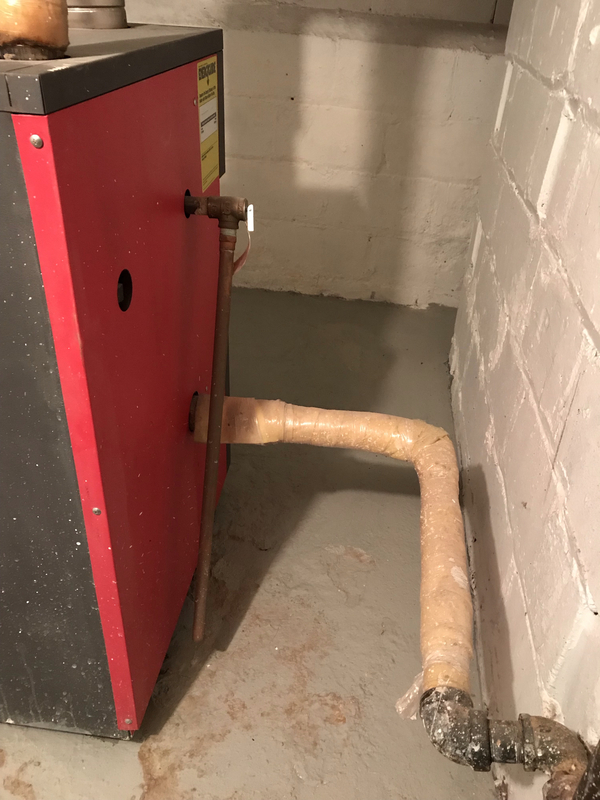 Be sure to drain your boiler down to the normal level before using it. Water drips down into the burner area. I’m thinking I need a new boiler now. I guess I can get that near boiler piping fixed now. 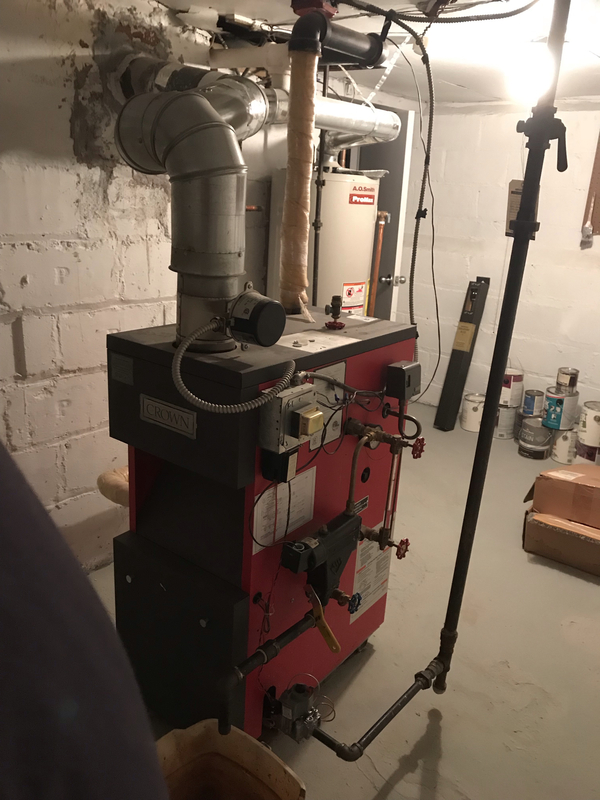 Please pick someone who will size and pipe that boiler correctly in NJ!!! @New England SteamWorks The homeowner and I yesterday scheduled for me to do a full system analysis and of course size up the boiler.